Project Women Warriors – Canadian based web series and blog. We are a community of #WomenWarriors highlighting resiliency and strength of women and girls. Today, #GirlBoss Ameera highlights her sister! #GirlBoss Ameera is highlighting her sister today! Today we’re inspired by Silvana and her mom! “Hi my name is Silvana, I’m 19 years old and I’m the oldest of 3! I grow up in a small town called dechemare, Eritrea. My mom left Eritrea to try and give us a better way of life. My mom traveled to Egypt, were she worked as a house cleaner and babysitter for more than 2 years and every penny she made sent us. After that she moved to Calgary, Canada, worked odd jobs in the day, went to night classes to learn English and landed a job as a nurse, after living in Calgary for 5 years the government approved her request to bring us here. Because of my mom I got to pursue the one thing I have always wanted to do, ACTING! So after living in Calgary for 6 years I moved to Vancouver when I was 18 and already finished a year and half intensive acting program at SC. Some may think that’s selfish but I’ve been through some dark times and I am pretty stoked I’ve come out of it all happy and healthy!! From sexual assault, depression, self abuse, death, heartbreaks and a variety of things in between… being at war with myself, remembering when getting out of bed was the biggest challenge… it’s definitely taken a few different attempts, but I’m alive to tell the tale. Many people go through similar, if not more traumatic, experiences in life and may not always talk about it! Remember that you are in control of your happiness!! Take charge, remove the toxins, speak positively about yourself, you are a goddess who deserves love and self care. My woman warrior is my momma. She raised 3 amazing kids, works full time, volunteers like crazy and is somehow always smiling. She is always there to catch me when I fall, keep me grounded and give me strength. She holds me and our family together, she is the glue. She’s my uptown funk I love you mom. Thank-you for the sweet submission Meagan. If you have a #womanwarrior in mind, we would love to highlight them. 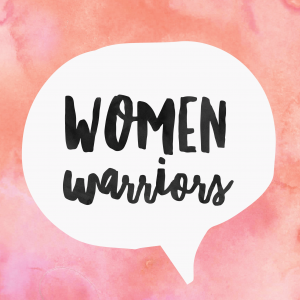 Find us on Instagram @projectwomenwarriors … A direct message is all it takes! Lea is an accomplished facilitator of the healing arts with a strong reputation for her quirky yet compassionate demeanour during classes, workshops, and one-on-one sessions. As a healer, coach, teacher, and speaker, Lea focuses her practice on coaching individual emotional resiliency, teaching you that your story is not your limitation. I met Leigh when we were 17 years old. Instant friends, I’ve often considered our love story one with karmic connections that go beyond our own understanding. She is the epitome of my soul mate, my mirror, my inspiration and comedic relief. We’ve been best friends for almost 22 years and have led our lives in synchronistic fashion that would make the doubtful, become the faithful. Leigh struggles with more diagnoses than anyone would think is humanly possible. From mental health battles, multiple surgeries, debilitating pain, hospitalized trauma; this woman has lived 50 lives in her one. She has a marriage stronger than most believe is possible in this day and age with two children that are the embodiment of kindness and empathy. She is a pillar of strength and humor, sharing her struggles with raw vulnerability and humor. She gets up every single day and chooses to fight for her life. She gets up every single day and chooses to be who she wants to be, despite what her medical files says she is. She is the definition of emotional resiliency and grace, a survivor of horrible circumstances beyond control, yet remains an advocate for the underdog. Passionate about the loves in her life, she inspires me to be more of myself every single day. My dear Leigh, you are a warrior. In every sense of the word. You are my heart. Thank you for who you are in my life, for teaching me that I can do anything I set my mind to. Our #WednesdayWarrior this week is mother of two, wife, #GirlBoss and small business owner, Yvette Cuthbert! Originally from Australia, Yvette moved to beautiful Port Moody in 2002 and took the ever-growing local ice cream shop, Rocky Point Ice Cream, by the reins alongside her husband, Jamie. Over time, the tiny storefront in Rocky Point Park has expanded to two ice cream trucks plus a trailer, collaborations with various local businesses, numerous award-wins including “Best Company” at the Small Business BC Awards, a cookbook, and now a new location in New Westminster, set to open this May. Yvette prides herself in employing local students, giving back to the community and being the best boss she can be. Yvette grew up in a home with entrepreneurial parents, which she says has shaped her into who she is today. She continues to be inspired each and every day by her community, her charismatic staff, her two children and her Gran. Thanks for sharing your story and inspiring others, Yvette! Today our #WednesdayWarrior is Britt! “My names Britt Lovell, I work in HR in Vancouver. I was born and raised in Vancouver. I love to inspire and motivate others to live the life they want to live and to live it fearlessly. Life’s too short to waste a moment caring what others may think of what we do for ourselves.